Mixing sound levels on a mixing board can be a complicated task, even more so in the live environment of a church. For this reason, some type of sound rehearsal should always be conducted prior to a service or performance, so the operator can calibrate the board, gauge settings, mark feedback thresholds and establish a reference of how to best mix the sound. These settings can be marked on the board or on a chart for easy reference later. Before performing a sound mix, first initialize the mixer controls by setting them to off, flat, or zero. This establishes a frame of reference and eliminates complications later. Make sure the master volume fader is all the way down or set to zero. After powering up your mixer console and other audio equipment, set your power amp volume to about 50% and turn it on. You always want to power up amplifiers last to avoid audio booms when you turn on the mixer. This can blow out speakers or damage circuitry. Gradually raise the master fader, and submaster faders, to the mid-center positions, usually marked by shading or lines. This position provides the least mixer noise or distortion. Start adjusting the mix with the lead singer or key instrument. Raise their volume fader to a pleasant level and use this as a reference for the rest (an initial reference is best obtained before the service). Adjust the individual volume of the other singers or musicians to blend together pleasantly. (You can do a quick rough adjustment on each and then go back and fine-tune each fader. However, never make such a fast change so it is noticeable to the congregation or invokes feedback.) Always remember that the lead singer or worship leader should have an slight edge on volume. Headphones are useful for blending a mix, but remember, the ambient sound will be slightly different than what you hear in the headphones. Your fine-tuning of the mix will need to be performed without headphones, listening to what the congregation hears. Hopefully, where youre operating sound is in an open enclosure, somewhere in the approximate center of the auditorium. This is the only way to gauge the ambient sound properly. Input faders must be adjusted so that the meter level reads approximately zero during the loudest volume. Less than this will allow hiss to be heard in the program sound  more than this (in the red zone) will cause distortion (a ragged, raspy edge to the sound). When maintaining a volume level, its not advisable to constantly raise and lower the volume with every dynamic change  just keep the volume at an acceptable average level, not too loud and not too quiet. If the dynamic extremes of the preacher/singer become too broad (speaks in a whisper, then screams, etc.) volume tracking obviously becomes necessary. This is best achieved by using a compressor/limiter which electronically lifts the lower volumes and limits the higher volumes from surpassing a defined level. 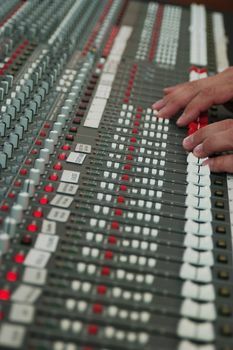 When mics on stage are not being used, it is best that they are muted off on the mixer board  this prevents unwanted feedback and eliminates ambient echo and phase shifting. A sound gate will perform this function automatically  it will mute the mic when no one is speaking, and will open instantly when someone speaks (sensitivity is adjustable). There are times that although voices are mixed together perfectly, they still will not sound good because of poor vocal quality. Unfortunately a sound operator will sometimes be blamed for a bad mix when its just bad singing. However, heres a trick. Identify the vocalists who sing best on key, and highlight their volume slightly  not a lot, just slightly! Reduce volume and high frequency gain slightly on those who sing off key. (Less high gain tends to take the edge off of sour notes.) People will think youre doing a better job mixing, but theyll not know why. Most preachers or broadcasters get used to hearing their voice through speakers and learn to gauge their vocal volume and tonal quality by what they hear. They need to have a consistently good monitor volume to feel confident with their voice. Too little volume through the monitor will cause a preacher (or singer) to eat the microphone, unconsciencely jamming it up to their mouth to make it louder. It will also cause them to strain their voice from trying to preach or sing louder. Too much volume will cause them to draw the mic too far away and cause them to speak meekly. Watch where they hold their mike  if too far away, lower the monitor volume. If too close, raise the volume. This article (VL-502) is copyrighted © by Dr. Dale A. Robbins, 1990-2019 and is a publication of Victorious Publications, Grass Valley, CA - Nashville, TN. Unless otherwise stated, all scripture references were taken from The New King James Bible, © Thomas Nelson Inc., 1982. You may download this article for personal use as long as you retain credit to the author. Obtain permission before reproducing copies for any reason, by filling out our simple use permission form. Many of our writings are also available as free pdf tri-fold pamphlets, which can be downloaded for reproduction from our Online Catalog. For media reproduction rights, or to obtain quantities of this title in other formats, email us. If you have appreciated these online materials, help us reach the world with the Gospel by considering a monthly or one-time tax-deductable donation.